Isle of Man millionaire Trevor Hemmings is celebrating a Grand National victory for the second time in six years. His horse Ballabriggs, ridden by jockey Jason Maguire, came home by two-and-a-quarter lengths in the famous race at Aintree, Liverpool on Saturday. 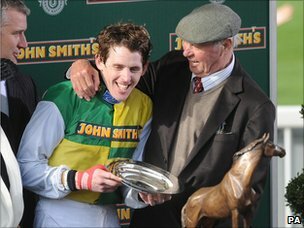 The 10-year-old was his second winner as his horse Hedgehunter came home first in 2005. The London-born businessman, 75, who grew up in Leyland, Lancashire, owns more than 100 racehorses. The winning horse was trained by Donald McCain, whose father Ginger trained famous national winner Red Rum. “Donald has done a brilliant job with Ballabriggs and clearly learned plenty from Ginger as they now have five National trophies on their mantelpiece,” said Mr Hemmings. Mr Hemmings, who is also the owner of Preston North End FC, was the person who introduced the Center Parcs holiday complexes to Britain. He currently owns two of Blackpool’s piers and recently sold the North Pier. Last year he sold the resort’s famous tower to the local council.